–Adele just lived out all of our fantasies by reportedly being mean to Chris Brown at the Grammys. 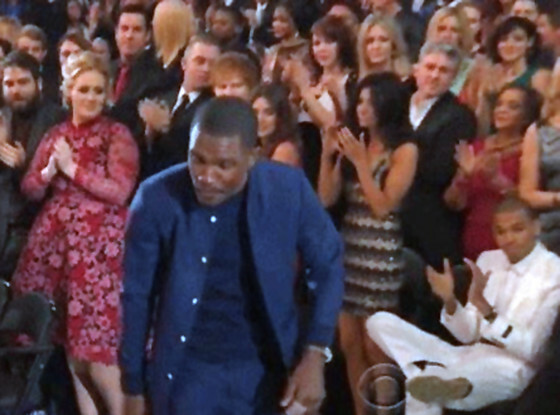 I love the shade she’s throwing at him in this photo where everyone but him is giving Frank Ocean a standing O. -Wait. Whatever happened, Adele ended up posing for a picture with Brown. Poo. -Meanwhile, Chris Brown wrecked his Porsche after being chased down by the paparazzi on his way to a charity event this weekend. I think this is the part where we’re supposed to feel sorry for him or something. -I didn’t think it was possible, but Angelina Jolie just took a bad photo. A bunch of ’em, actually. –Drake made a new video about how he clawed his way up from the bottom (if you consider Forest Hill, one of Toronto’s ritziest ‘hoods, “the bottom”) and it features him working at Shoppers Drug Mart! -Guys, Madonna just joined Instagram and it’s awesome, mostly because the last three pics she’s posted are super unflattering. –Jesse Eisenberg is transitioning from actor to actor/playwright. –Justin Bieber (who was surprisingly not as terrible as I thought he’d be on SNL) didn’t let a little blizzard get him down this weekend. He laughed off the snow with an “I’m Canadian” tweet and treated his fans waiting outside to pizza. –Blake Lively skipped New York Fashion Week to hang out with Ryan Reynolds on the set of his new movie in Sudbury, Ontario. It’s like I don’t even know who she is any more. –Leonardo DiCaprio still appears to be modelling his life after an Entourage episode. -Meanwhile, I got Leo in Buzzfeed’s “Which 90s Dreamboat Is Your Perfect Valentine?” quiz, which clearly means it’s broken. -I love this: fictional character April Ludgate penned a tribute to Neutral Milk Hotel’s real album. –The Black Keys may have won big last night, but it’s not all good news. Frontman Dan Auerbach split from his wife. -In other magazine news, Taylor Swift looks adorably mod on the cover of Elle. -Whoa. The Walking Dead‘s return last night scored a series high of 12.3 million viewers. And in the all-important 18-49 demo, it’s beating shows like American Idol, Modern Family, The Big Bang Theory and NCIS. That’s NUTS. –Saoirse Ronan is the latest star to jump onboard Ryan Gosling’s directorial debut. Who isn’t going to be in this thing? –Jessica Chastain slammed those stupid rumours about a feud with Jennifer Lawrence. -Speaking of JLaw, she appeared on an Oscar edition of Zach Galifianakis’ Between Two Ferns, in which she managed to out-Zach Galifianakis him. -Oh happy day! A new Postal Service song! –Celine Dion would like to wish you a happy Gung Hay Fat Choy…in the most embarrassing way possible. -The first trailer for the Morgan Spurlock-directed One Direction 3D movie is out. So this is really happening, then? -The cast of Party Down reunited onstage this weekend (even wearing the pink bowties) but were unable to confirm those movie rumours. –Kristen Stewart (or at least Kristen Stewart’s forehead) showed up in a party pic on Ellie Goulding’s Instagram. –Justin Timberlake released a new song today but it’s longer than 8 minutes and despite everyone going crazy about his Grammy performance last night, I just can’t seem to bring myself to listen to.